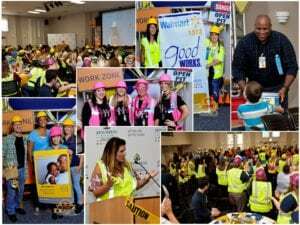 On Thursday, August 17, the Corporate Engagement Team at Johns Hopkins All Children’s Hospital hosted the 26th Annual Walmart and Sam’s Club Day. Walmart and Sam’s Club, a CMN Hospitals partner, raises funds for the hospital year round which includes a register campaign from September 7 – October 8. At the annual luncheon we celebrate their fundraising efforts from the previous year, talk about the campaign for this year and motivate associates to continue to raise funds for the hospital. This year’s theme was Building Miracles to coincide with the construction of our new Research and Education Building. This year was extra special as it marked 30 years of support from our Walmart and Sam’s Club locations in which they have raised $16.4 million for Johns Hopkins All Children’s.